Hello Bob, Thank you for following up. While I really appreciate your kind offer to meet and discuss, my mind is fully set. There is little reason to talk further, and I've arrived at this place after a tremendous amount of research, thought, and first hand experiences. To start, I've lived in the downtown Utica neighborhood your business seeks to bulldoze. My retirement was planned downtown near your would-be hospital district; this after hundreds of thousands of dollars redeveloping a Historic Property - a mere 2,000 feet from your "Oneida County Health Care Facility Transformation" concept. Take a look at my dilemma, as I am up against Utica City Hall, the capital (Albany), and dozens of "community leaders" comfortably situated in their village, suburban and countryside homes. What is their view, their knowledge, of Downtown Utica? Do they care what I think? No! Have they heard that people, worldwide, are returning to urban living? I can assure you, it is not to frolic upon an integrated healthcare campus that you and others are imagining. So, in your upcoming meetings with your colleagues, please report to them that I'm not interested in trying to make their hospital concept "fit into" my Downtown Utica. I will not stop working to protect downtown. 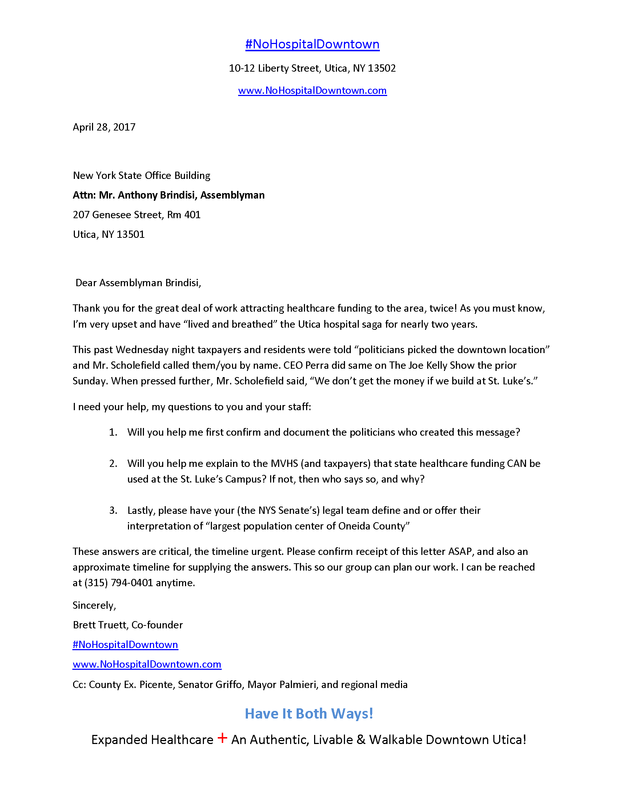 However, I'm very willing to support medical and hospital professionals in finding a way to invest taxpayer funding at the current Faxton and St. Luke's Campuses (See Letter); and now that we know the St. Elizabeth's Nursing School does not wish to relocate (as you reported Wednesday), that campus too has a future! By the way, you must admit that your explanation of the nursing school not moving is diametrically opposed to the downtown hospital concept, right? I'm saddened that politicians have hijacked your hospital expansion plans, and that their agents have corrupted the health care process through many meetings, community groups and a sorry attempt to involve "economic development". I find it very perverse that all these folks are suggesting they've found a source of great economic development in their downtown hospital concept. My money and energy is and will continue to be 100% dedicated to protecting Downtown Utica against an inner-city hospital district, or as your PR and reputation management teams like to say, a "Healthcare Campus". Our views should not be discounted if you truly believe regional healthcare is troubled by our current facilities. Why? The Mohawk Valley Health System has been set-up for unnecessary delays already, and will face no less than five more years of delays from our (and other) groups, and this is to say nothing of the growing dissatisfaction of taxpayers and residents. Yes, perhaps you've planned an expensive advertising campaign (one much like Cuomo's worldwide and long-running "New York Opened for Business") with glowing pictures of your Downtown Utica Health Campus, but just like Cuomo's, it will come-up empty. Few jobs in Cuomo's case, and no downtown hospital in MVHS's case. If you want address my concerns, then let us meet! Otherwise, my efforts are centered on total opposition and legal actions. All this aside, your presentation and Q & A was much appreciated. It's been two years, and I'm still discovering new facets of Fiasco General, a.k.a. Utica's #hospitalgate. Under different circumstances, I believe we could enjoy each other's company. Sadly, our politicians have placed us in this predicament, and seem committed to endorsing a corrupt process.